On Friday, the Bank of Japan (BOJ) concluded its 2-day March monetary policy review meeting and left the monetary policy settings unchanged, holding rates at -10bps while maintaining 10yr JGB yield target at 0.00%. Reuters reports the following headlines on the Bank of Japan’s (BOJ) economic assessment. Japan's economy expanding moderately but exports, output affected by overseas slowdown. The Japanese yen was little moved after the Bank of Japan (BOJ) left interest rates unchanged. This was the 32nd month straight of no monetary policy changes. The base lending rate was left at minus 0.1%, which was expected by analysts. In August, the central bank tweaked its ¥80tn-a-year quantitative easing program to strengthen its framework for powerful continuous easing. Reuters reports additional insights on the Bank of Japan’s (BoJ) monetary policy decision, with the key points found below. Leaves unchanged forward guidance on rates. Will keep current extremely low rates for an extended period of time. POLICY BOARD. The Policy Board is established as the Bank's highest decision-making body. The Board determines the guideline for currency and monetary control, sets the basic principles for carrying out the Bank's operations, and oversees the fulfillment of the duties of the Bank's officers, excluding Auditors and Counsellors. HISTORY. The Bank of Japan was established under the Bank of Japan Act (promulgated in June 1882) and began operating on October 10, 1882, as the nation's central bank. The Bank was reorganized on May 1, 1942 in conformity with the Bank of Japan Act (hereafter the Act of 1942), promulgated in February 1942. The Act of 1942 strongly reflected the wartime situation: for example, Article 1 stated the objectives of the Bank as "the regulation of the currency, control and facilitation of credit and finance, and the maintenance and fostering of the credit system, pursuant to national policy, in order that the general economic activities of the nation might adequately be enhanced." The Act of 1942 was amended several times after World War II. Such amendments included the establishment of the Policy Board as the Bank's highest decision-making body in June 1949. The Act of 1942 was revised completely in June 1997 under the two principles of "independence" and "transparency." The revised act (the Act) came into effect on April 1, 1998. 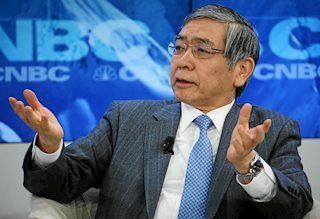 Haruhiko Kuroda was born in Omuta, in 1944. He is the 31st and current Governor of the Bank of Japan (BOJ). He was formerly the President of the Asian Development Bank from 1 February 2005 to 18 March 2013.